Classic Industries offers a wide selection of Cooling System Components for your Chevrolet Chevy II Nova. Classic Industries offers Chevrolet Chevy II Nova Hose Clamps, Chevrolet Chevy II Nova Heater Hose Clamps, Chevrolet Chevy II Nova Radiator Hose Clamps, Chevrolet Chevy II Nova Tower Style Hose Clamps, Chevrolet Chevy II Nova Heat-Shrink Hose Clamps, Chevrolet Chevy II Nova Corbin Style Hose Clamps, and Chevrolet Chevy II Nova Radiator & Heater Hose Clamp Set. 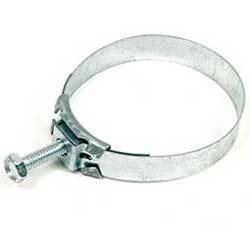 Tower Style Hose Clamp - 2 5/16"